Kindle Travel Deals for Wednesday! 5 Awesome Free Kindle Travel Books for Tuesday! Kindle Travel Deals for Thursday! **Arctic Wonders by Speedy Publishing. Price: Free. Genre: Nonfiction, Travel, Arctic & Antarctica. Rated: 4.4 stars on 59 Reviews. 50 pages. ASIN: B00RVZLROK. Posted on June 30, 2016 Author KibetCategories Free Travel Kindle Books, TravelersLeave a comment on Kindle Travel Deals for Thursday! *BACKPACKING: For Beginners to Experts – The Ultimate Guide, Everything You Need To Know! (Backpacking Books, Camping, Travel Guide, Backpacking) by Kiera Goodwin. Price: Free. Genre: Travel, Specialty Travel, Ecotourism. Rated: 4.6 stars on 44 Reviews. 44 pages. ASIN: BACKPACKING. *LONDON: London’s Essential Travel Guide – Where to go and What to do…***Everything covered for your Trip to London!!! *** (London, London Travel, London Travel Guide) by E Travel Guides. Price: Free. Genre: Travel, Europe, Great Britain, England, London. Rated: 4.6 stars on 16 Reviews. 84 pages. ASIN: B01HK1EVYM. *NEW YORK: New York Essential Travel Guide – Where to go and What to do…***Everything covered for your Trip to New York!!! *** (New York Including City Map!!!) by E Travel Guides. Price: Free. Genre: Travel, United States, Northeast, General. Rated: 4.5 stars on 13 Reviews. 52 pages. ASIN: B01HK1VJ92. BANGKOK: Bangkok Essential Travel Guide – Where to go and What to do-*Everything covered for your Trip to Bangkok! * (Bangkok,Travel Guide *Including Bangkok Map! *) by E Travel Guides. Price: Free. Genre: Travel, Asia, China, General. Rated: 4.2 stars on 18 Reviews. 39 pages. ASIN: B01HJAL6YW. Posted on June 29, 2016 Author KibetCategories Free Travel Kindle BooksLeave a comment on Kindle Travel Deals for Wednesday! The Hawaiian Archipelago by Isabella L. (Isabella Lucy) Bird. Price: Free. Genre: Biographies & Memoirs, Travelers & Explorers, History, Australia & Oceania, Oceania, Travel, Travel Writing. Rated: 4.4 stars on 24 Reviews. 286 pages. ASIN: B004TS0AXG. *The Ultimate Guide To Family Travel: How To Make Travel With Kids Fun And Easy by Ralph Cockburn, Shaina Cockburn. Price: Free. Genre: Parenting & Relationships, Family Activities, Travel, Specialty Travel, Family Travel. Rated: 4.9 stars on 11 Reviews. 80 pages. ASIN: B01EXE9HT8. Kindle Travel Deals for Sunday! *Switzerland Travel Guide Tips & Advice For Long Vacations or Short Trips – Trip to Relax & Discover Swiss, Food, Drink, Restaurants, Bars,Night life, Music: … Save Time & Money (TravelGuideTeam Book 13) by TravelGuideTeam . Price: Free. Genre: Travel, Food, Lodging & Transportation, Railroad Travel. Rated: 4.8 stars on 10 Reviews. 43 pages. ASIN: B01GGSXREA. Berlin Travel Guide: Berlin, Germany: Travel Guide Book-A Comprehensive 5-Day Travel Guide to Berlin, Germany & Unforgettable German Travel (Best Travel Guides to Europe Series Book 17) by Passport to European Travel Guides . Price: Free. Genre: Travel, Europe, Germany, Berlin. Rated: 4.1 stars on 24 Reviews. 66 pages. ASIN: B015Y2GXMM. Posted on June 26, 2016 Author KibetCategories Free Travel Kindle BooksLeave a comment on Kindle Travel Deals for Sunday! Kindle Travel Deals for Saturday! *Kitten Love: The Trilogy by Ariele M. Huff . Price: Free. Genre: Biographies & Memoirs, Travel. Rated: 5 stars on 7 Reviews. 102 pages. ASIN: B0167GEGFA. The Mojo Diaries: How a Dangerous and Hilarious Journey Changed Everything from Leon Logothetis, author of The Kindness Diaries by Leon Logothetis. Price: Free. Genre: Biographies & Memoirs, Travel. Rated: 4.1 stars on 8 Reviews. 48 pages. ASIN: B01678PKGC. The Malay Archipelago, the land of the orang-utan and the bird of paradise; a narrative of travel, with studies of man and nature – Volume 2 by Alfred Russel Wallace. Price: Free. Genre: History, Asia. Rated: 4 stars on 11 Reviews. 243 pages. ASIN: B0082XM9QU. Posted on June 25, 2016 Author KibetCategories Biographies, Free Travel Kindle Books, history, memoirLeave a comment on Kindle Travel Deals for Saturday! Kindle Travel Deals for Friday! The Albert N’Yanza, Great Basin of the Nile by Samuel White Baker. Price: Free. Genre: Travel, Africa, Egypt, History, General. Rated: 4.4 stars on 7 Reviews. 367 pages. ASIN: B004TP0JEY. Posted on June 24, 2016 Author KibetCategories Free Travel Kindle Books, memoir, TravelersLeave a comment on Kindle Travel Deals for Friday! Informative, Enticing and Spot On! 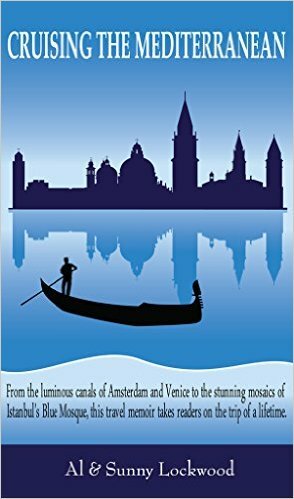 *Cruising the Mediterranean: From the luminous canals of Amsterdam and Venice to the stunning mosaics of Istanbul’s Blue Mosque, this travel memoir takes readers on the trip of a lifetime. (Deal, Not Free) by Al Lockwood, Sunny Lockwood. Price: $0.99. Genre: Memoirs Deal, Sponsor, Senior Travel, Amsterdam, Venice, Western Europe. Rated: 5 stars on 6 Reviews. 304 pages. ASIN: B01D8XZOY2. *Healing, Hope, and Wholeness: A journey of grief and healing through travel, people, and music. by Ceci Frost. Price: Free. Genre: Biographies & Memoirs, Memoirs. Rated: 5 stars on 5 Reviews. 125 pages. ASIN: B012EJJ06E. *Travel Deeper: A Globetrotter’s Guide to Starting a Business Abroad by Ryan Spiegel. Price: Free. Genre: Business & Money, Small Business & Entrepreneurship. Rated: 5 stars on 8 Reviews. 132 pages. ASIN: B01H34TTU2. Posted on June 22, 2016 Author KibetCategories $1 Travel deals, Free Travel Kindle Books, memoir, TravelersLeave a comment on Kindle Travel Deals for Wednesday! Kindle Travel Deals for Tuesday! Posted on June 21, 2016 Author KibetCategories $1 Travel deals, memoir, TravelersLeave a comment on Kindle Travel Deals for Tuesday! *Germany Travel Guide Tips & Advice For Long Vacations or Short Trips – Trip to Relax & Discover New, Food, Drink, Restaurants, Bars,Night life, Music: Save Time & Money (Europe Travel Book 10) by TravelGuideTeam. Price: Free. Genre: Self-Help, Travel. Rated 4.9 stars on 10 reviews. 103 pages. ASIN: B01GGR7HJW. Posted on June 20, 2016 Author KibetCategories Free Travel Kindle Books, TravelersLeave a comment on Kindle Travel Deals for Sunday! Chiang Mai: Chiang Mai Travel Guide, Thailand Travel Guide (Chiang Mai Travel Guide, Thailand Guidebook, Chiang Mai Guide Book, Chiang Mai Thailand, Chiang Mai Digital) by Thailand Travel Guides. Price: Free. Genre: Travel, Specialty Travel , Tourist Destinations & Museums. Rated 4.5 stars on 14 reviews. 129 pages. ASIN. B01D4YAEYK. Posted on June 18, 2016 Author KibetCategories Free Travel Kindle Books, TravelersLeave a comment on Kindle Travel Deals for Saturday!